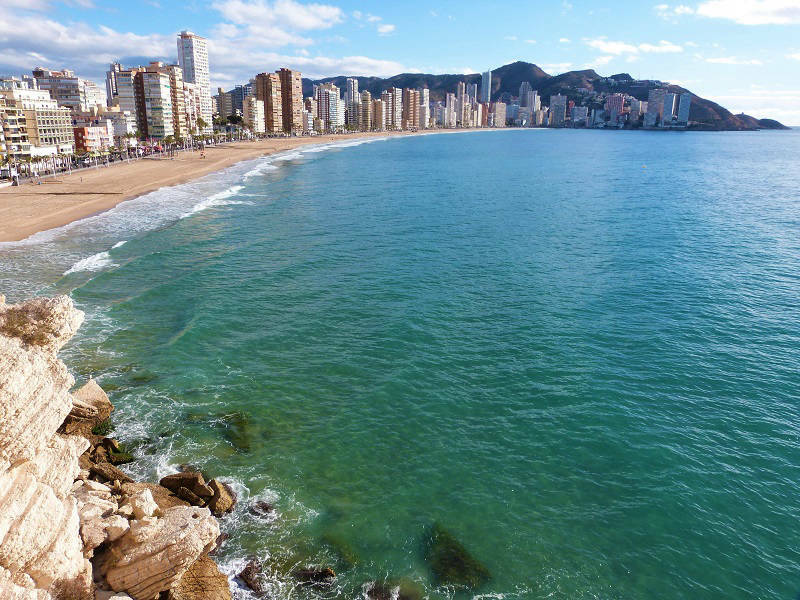 Benidorm Playa Levante, the beating heart of the Costa Blanca for classic beach holidays in Spain. 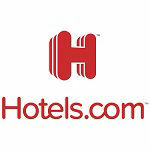 Something for everyone, from cheap and cheerful to top notch four star superior hotels in the resort that never sleeps. 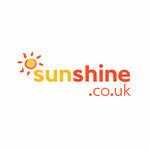 Plus over 300 days of guaranteed sunshine every year! 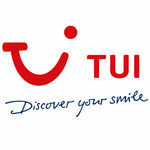 If you are looking for good value, near the beach, all-inclusive and for grown ups only? 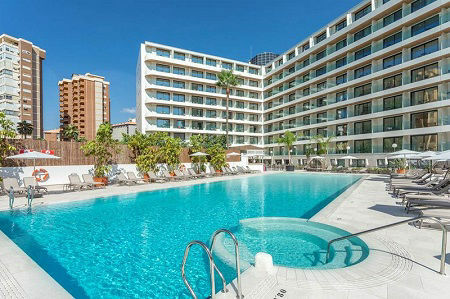 May we suggest the 3 star MedPlaya Hotel Riudor. This is where all the FUN starts and it NEVER stops! 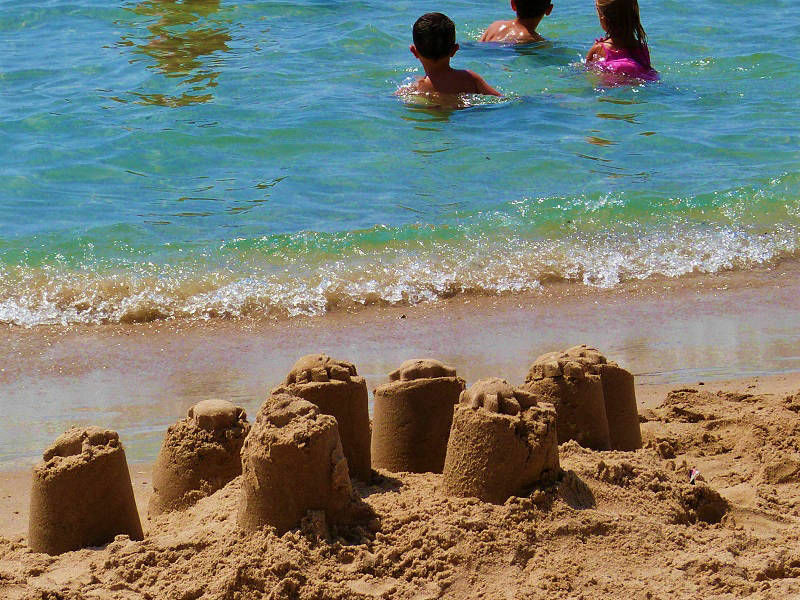 Sand Castles, Sunbeds, Pubs, Clubs, Hotels and a bit of a stroll along the promenade. 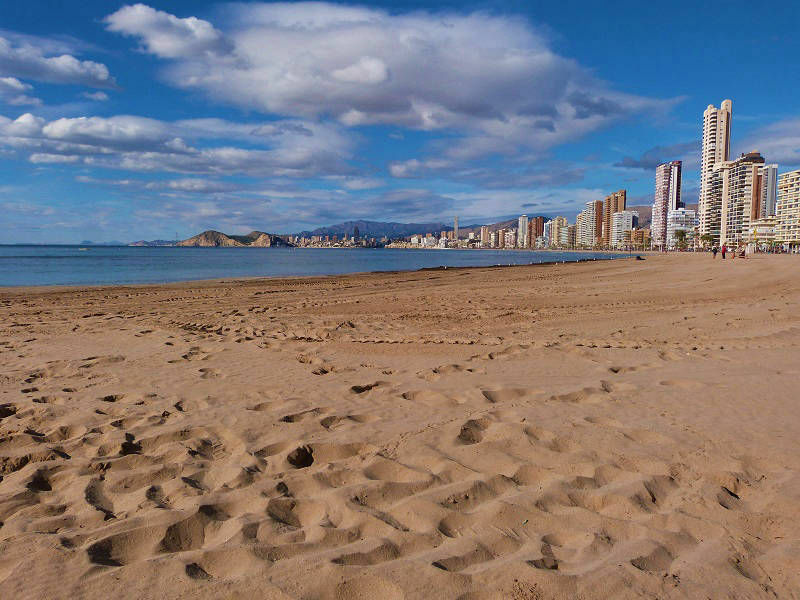 The 2.2km pristine white sandy beach with the wide Avenida Madrid promenade is without any doubt the biggest draw to Benidorm. 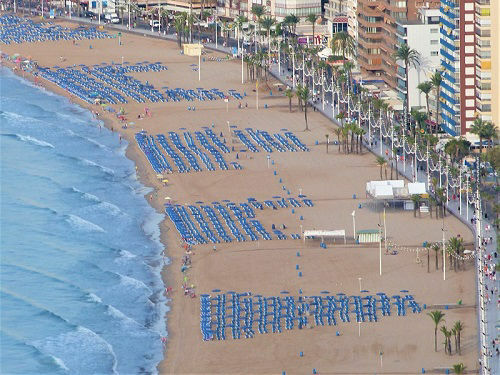 The Levante Playa is one of the best resort beaches in Spain. 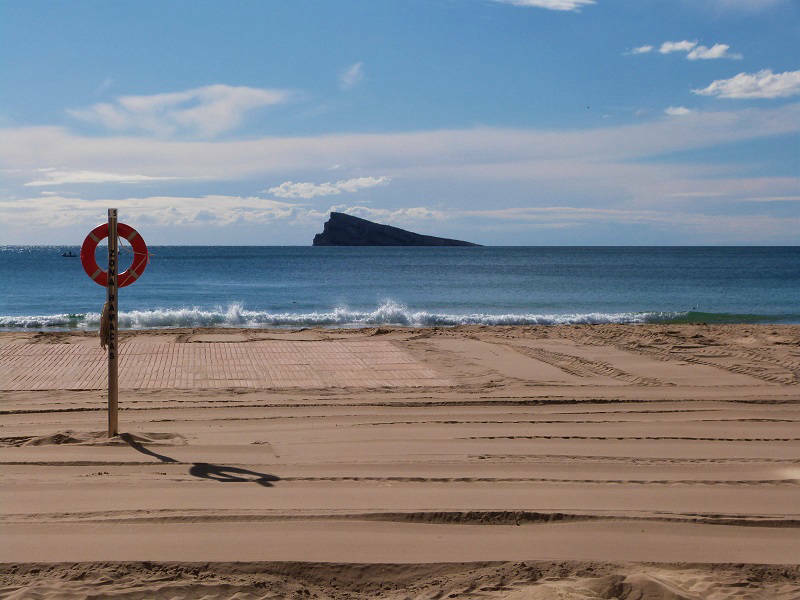 You can get a nice cup of tea, fish and chips, pint of the black stuff and even build a sand castle on a day on the Benidorm sands! 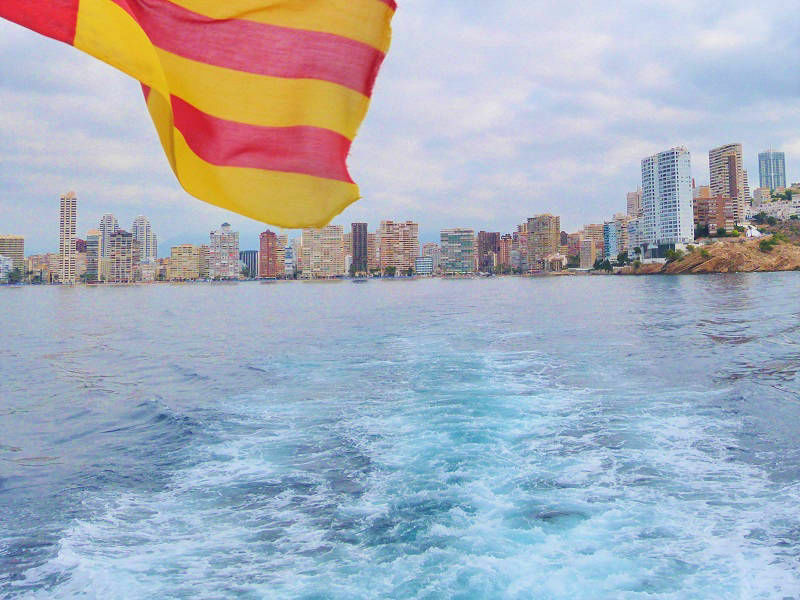 The sheltered bay stretches from the Balcón del Mediterráneo in the old town, to the Jet-Ski in the Rincon de Loix. 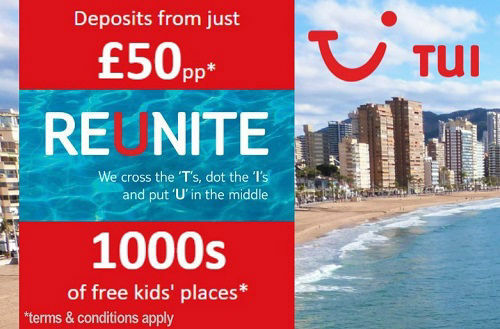 On offer is safe swimming, thousands of blue sunbeds and parasols and the amazing promenade which gets packed every morning and at sunset for the traditional stroll along the beach. 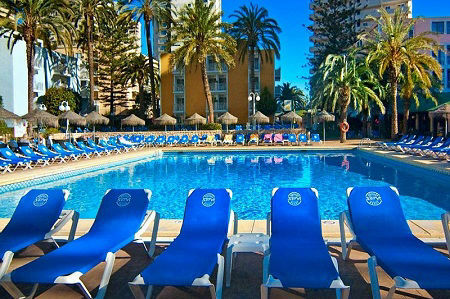 This is a true beach paradise by day and clubbers paradise at night with two big beach terraces clubs to choose from. The promenade offers a 4.4km walk if you do the entire beach and back. A great way to work off a big British breakfast or simply to people watch and stop off for a coffee, glass of wine or choose from over 200 different ice creams at the many “heladeria” dotted along the beach. 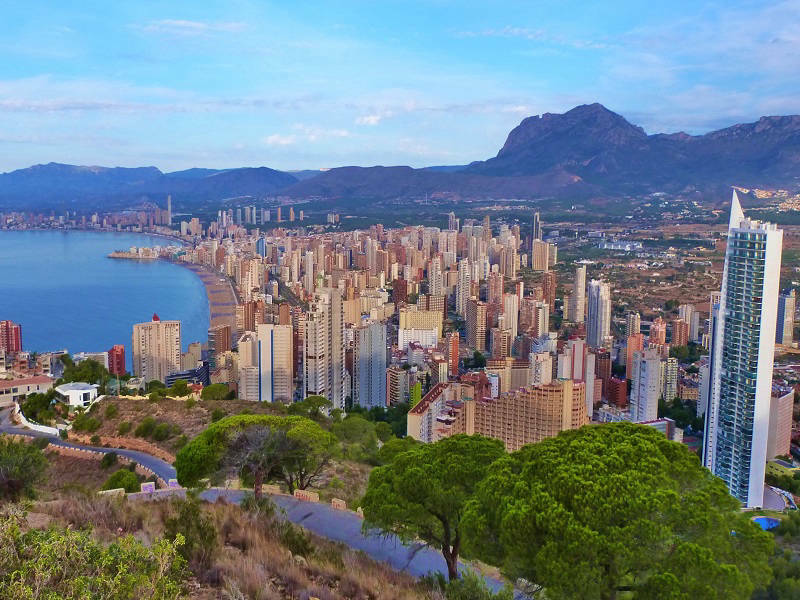 And rising out of the landscape behind the beach the Benidorm skyline twinkles at you day and night with over 500 café bars, English pubs, big show bars, late night clubs and more than 200 hotels to eat, sleep and drink your way through a classic holiday in Spain. 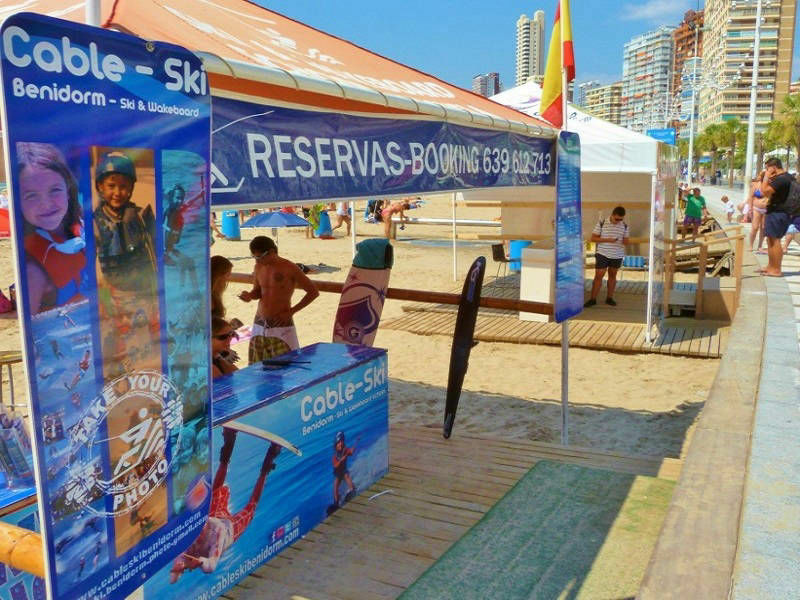 There really is something for everyone, Benidorm is so much more!. You will not be short of dining options there are traditional British pubs serving ridiculously large portions of all day breakfasts and every day roasts, Chinese and Indian restaurants for late night eats, Pizza places galore and Steak houses for big meat eaters. If you prefer take-out, there are Kebab and Burger cafés on every corner serving until well after closing time. 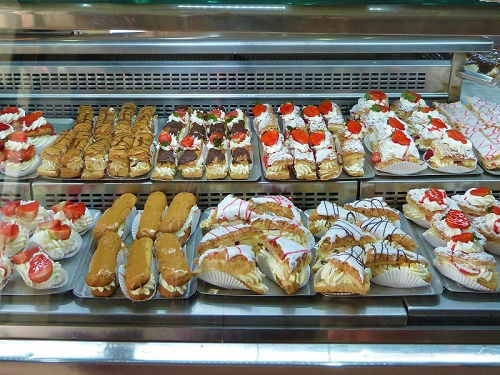 You will get good honest food, comfort food and even yummy cream cakes in the Indoor Market. There are not really any top quality traditional Spanish restaurants or fine dining places on the Levante, for that you need to head into the old town, where you will discover great food. There is no shortage of pubs and bars to choose from, you will find one every six metres and on every road. 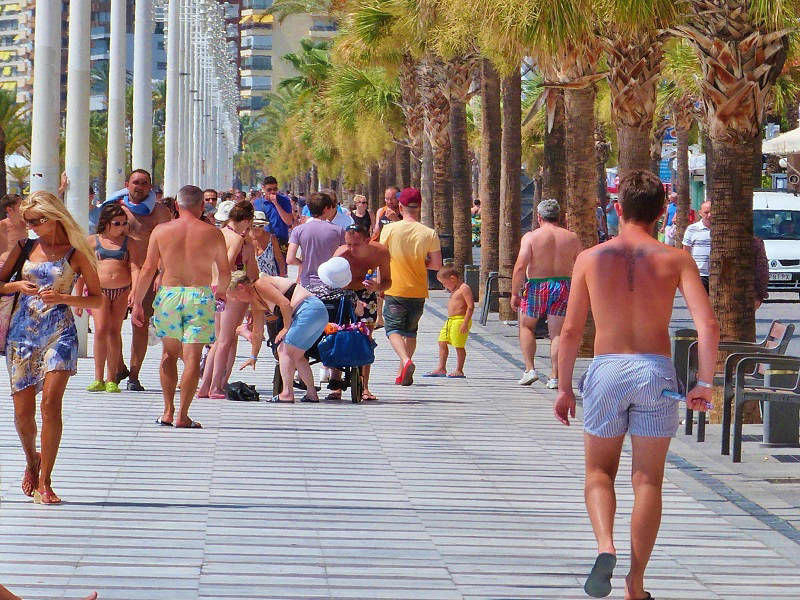 During the day, especially at weekends the Levante beach is the place to meet up. 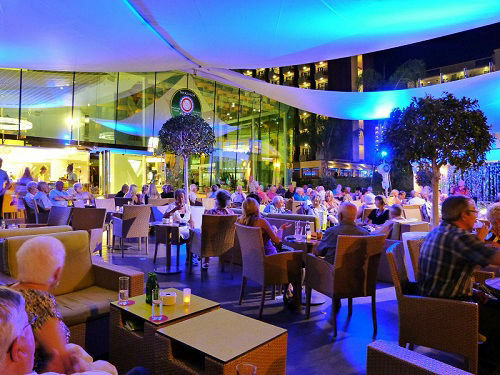 Choose your thing, from quiet funky beach terrace bars to big packed and loud rock bars, disco bars, Irish pubs and the Tikki Beach Bar (the meeting place on the beach for British Stag, Hen and party people). 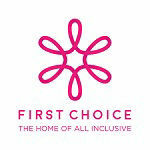 There are 50 venues along the promenade to choose from, a quick stroll will soon find your style. When the day starts to wind down and everyone heads back to their hotels to eat and get ready for the night, the beach bars become quieter for a while! At night everything moves inland a few streets from the beach as Neon City in the Rincon de Loix wakes up ready to entertain the British visitors. This is the place for the best free cabaret shows on the coast. You can hop from venue to venue and see whatever tickles your fancy, singers, comedians and tribute acts by the dozen. 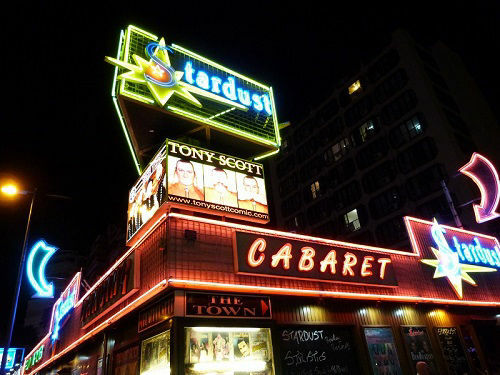 As things hot up everyone heads to the English Square where the big night clubs like "Café Benidom" will keep you going until the sun comes up and it is time to start all over again! 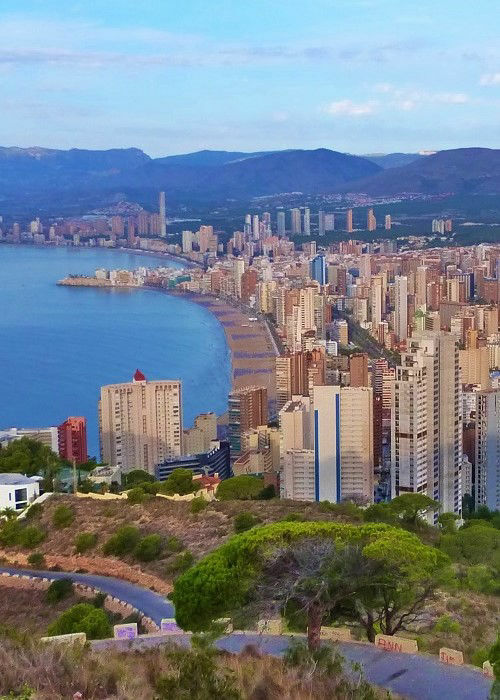 If all that is just too much for you see the Poniente Playa or the Old Town for a much quieter holiday option. REFURBISHED in 2015, with bright sunny rooms. 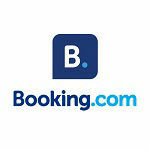 Superb location in the Rincon de Loix, very near the Levante beach. 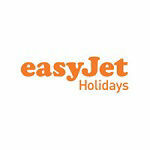 Hits the spot for Benidorm classic premium beach holidays in Spain. 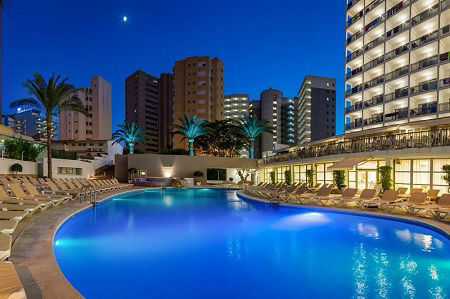 A NEW superior four star hotel located in the very heart of Benidorm just a few minutes from top entertainment and the beach. Totally renovated from top to bottom. Fab! A tropical paradise in a quiet area. A luxury 4 star hotel. 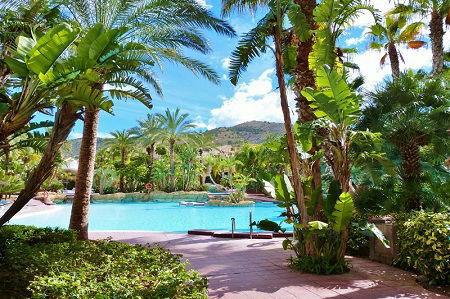 Huge lagoon pool and tropical gardens plus top facilities. MÉLIA rooms or premium adult LEVEL. 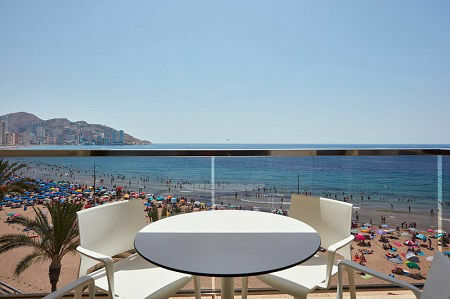 A family 4 star hotel resort on the Coast Blanca in Benidorm. 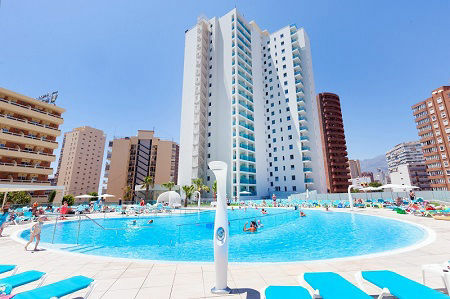 Located in the Levante Playa. 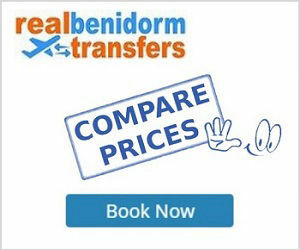 An ideal choice to enjoy the best Benidorm nightlife and the Tapas bars in the old town. 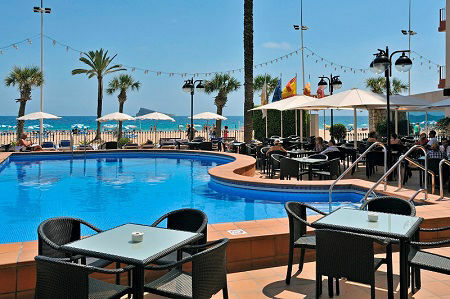 One of the best 3 star hotels in Benidorm for a quieter relaxed break, yet close to all the action. Good reviews for food from British guest. Ideal choice for families and couples..
Bang on the promenade overlooking the sand and sea there really is no better location than this. An oasis for grown ups with a lovely sunny terrace and pool. 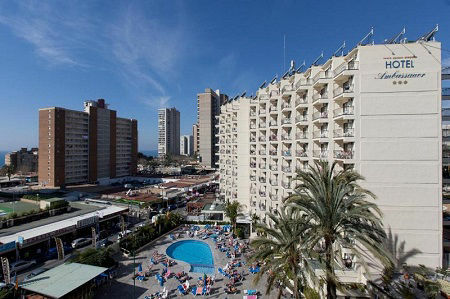 Superbly lovely beach apartments in Benidorm old town. Total top to bottom redesign to a very high standard in 2014. Only 33 apartments. Sea view or side view studios. Popular!